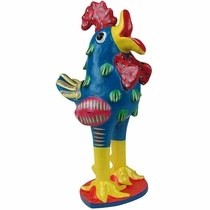 These fun and imaginative animal figurines, created by the ceramic artists of Ocumichu, are handmade and hand painted. 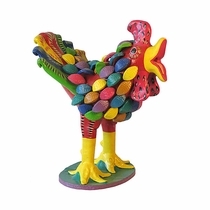 These colorfully painted clay creations represent Mexico's proud folk art history and each has its own unique character. 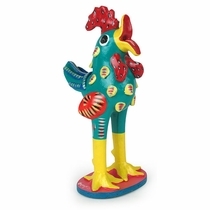 Animals have always been a favorite subject matter of the folk artists in Mexico. No two pieces are alike and come in a variety of colors with hand painted design embellishments. 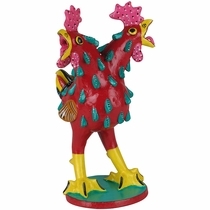 The piece we ship to you will not be exactly as pictured on our web site. Direct From Mexico will always carefully pack your order for safe delivery. 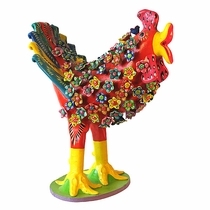 These unique and colorful collectibles will add an authentic Mexican charm to your decor. 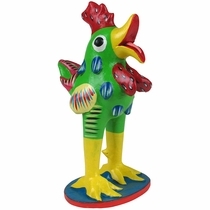 Click on the animal figurines below for more information and ordering. 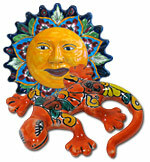 Be sure to check out our Talavera animals and wall art accents. 10" h x 5.5" dia.